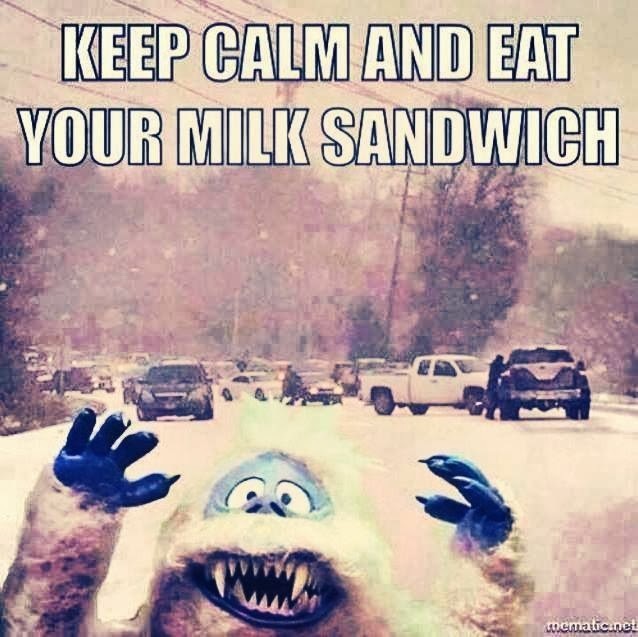 ​My daughter, who is a graduate student in England, says that the rush to buy bread, milk, and eggs before a storm is referred to there as “the French toast panic”. On one level, I can see this as a reasonable approach; with those three staples, you can make a reasonable meal of toast and omelet, providing you have power or a working cooking surface (like a propane grill). You can even keep them fresh in a power outage by simply putting them out in the snow by your door. I think the urge to get these particular supplies is strongest in a certain age group: those who grew up in the Depression through the early 1950s, when such commodities were delivered daily to your door … and a major storm could halt deliveries for a few days. It’s not about hunkering down. It’s about milk, bread, and eggs being items that have to be bought frequently. I don’t need to make the pre-storm run on canned goods because I already have them. We have tons of soups and other canned goods because we stock up on those at Costco precisely because they have a long shelf life. Milk doesn’t have a long shelf life, so I run out of it and do need to pick some up every week. Plus my picky two-year-old might fight me on the non-perishable items, but she will always drink milk, so I know she is at least getting some nutrients. Watching the cable news channels yesterday afternoon, I seriously kept getting the urge to run out and buy emergency supplies … and I live in Palm Springs. It reminded me of my time living in Miami and the contagious panic-shopping people would do before hurricanes. I had gone to the drugstore on my lunch break (on a gorgeous sunny afternoon) and they were completely out of toilet paper. When I asked the cashier why, she replied “Because of Frances.” I said “Who is Frances?”, thinking it was a woman who hadn’t shown up for her shift or something. “No! The hurricane!” she told me. Frances was still at least three days out in the Caribbean, but people were already panicking … not just buying a few supplies, but stocking up like it was the apocalypse. Of course, I spent the afternoon driving to various stores until I found some TP for myself. I am glad to know that I am not the only person with the hunker mindset. And I admit storms aren’t the only thing that cause me to panic. All I have to do is read a post-apocalyptic novel, which not only makes me feel inadequately stocked, but completely ill-prepared for a dramatic lifestyle change. After finishing Station Eleven (an account of the world after a devastating flu wipes out 99% of the population) and the last segment of David Mitchell’s Bone Clocks (which describes in vivid detail the struggles of living in a society where there is no power), I desperately needed a trip to Costco to buy every basic good I could find. I’m embarrassed to admit I did “hunker down” buying extra batteries, extra soap, extra ibuprofen, extra Neosporin, extra toilet paper – never mind that most of this stuff will go bad in a few years, and be depleted in no time if there ever really is a societal breakdown (assuming I don’t get raped, pillaged and murdered first). My husband just shakes his head at me (rightly so). But, no doubt – it made me feel better even though I know the feeling of being “safe” is only illusory.